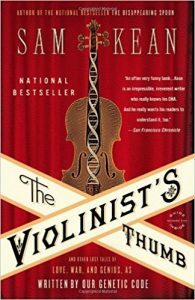 In The Violinist’s Thumb, Sam Kean takes us on a tour of how we have learned about the genes that define us and the implications of some of discoveries behind that science. I admit that biology is not my favorite branch of science, but Kean does an excellent job of telling an engaging story about the people, their world, and their discoveries that have led to our current understanding of how our genes impact everything from our behavior to our talents to our interactions with the rest of nature. For anyone with even a passing interest in our genes and DNA, what makes us tick biologically, and how we’ve learned what we learned, this is a great book. Kean’s focus is on DNA, the science that, over many years, led to our discovery and subsequent understanding of what DNA does, and the people behind that discovery. As he guides us through the history of DNA science, he also takes us on interesting detours, introducing us to non-scientists whose lives demonstrate the point he is trying to make. These are people with either less common genes or mutations that gave them some benefit, such as more flexible hands for playing, for example, a violin, but often also made them rather sickly and not long for the world. Ultraviolet light can cause kinks in certain places in DNA. Nearly all animals and plants have enzymes that can fix these kinks. Mammals don’t. That is why mammals sunburn. Women were typically not admitted into the science club. One exception were Catholic nuns, who were unmarried and had the financial support and independence from the church-run convents to pursue science. Our DNA isn’t entirely “human” – about 8 percent is ancient virus DNA, that was introduced as viruses attacked our ancient ancestors. Trauma we experience can be passed down to our children and, even more amazingly, to their children. Women with PTSD from the 9/11 attacks who had kids, particularly those who were in their third trimester at the time, have kids with higher levels of anxiety and acute distress than others in some situations.